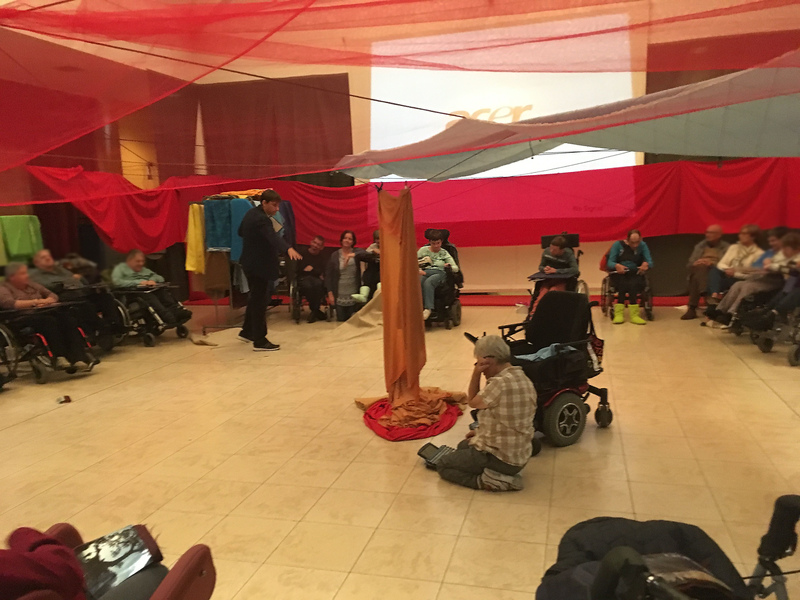 During our week long stay at the Huize Eyckerheyde Residence in Belgium, a residence for people with disabilities, we ran daily Envisioned Scenography workshops. 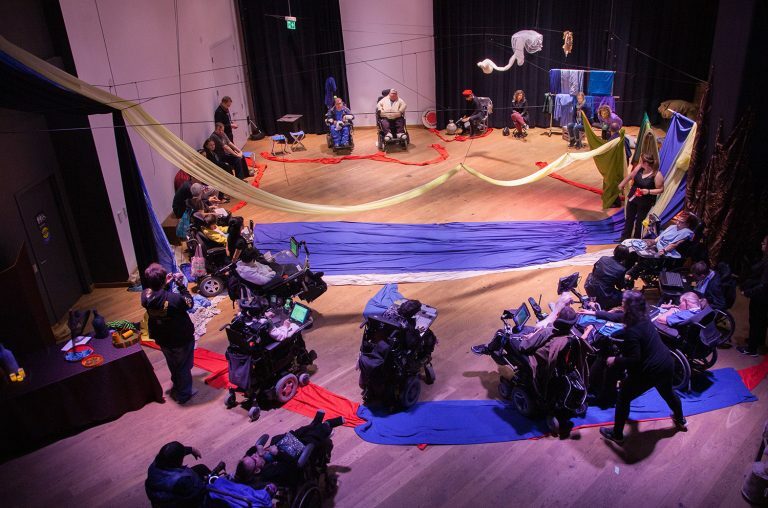 Residents created various worlds using fabric, and brought these to life. This ranged from people being ants in the grass of a summer garden party, looking up at the guests eating, while children played around a conservatory; to a church service, with all present, along a historic waterfront. The final day was a Come to the Edge event for family and friends, complete with Belgium donuts made by the staff. Audience looked at photo cards as they pondered what they think is possible. They were invited to choose a fabric whose texture provided them with the power to come closer to the edge. After crossing the edge, the large group improvised a story around a town, with a church, garage, and nearby forest. A traveler arrived, and from the church on the hill, there was spotted a fire in the town, growing out of control. 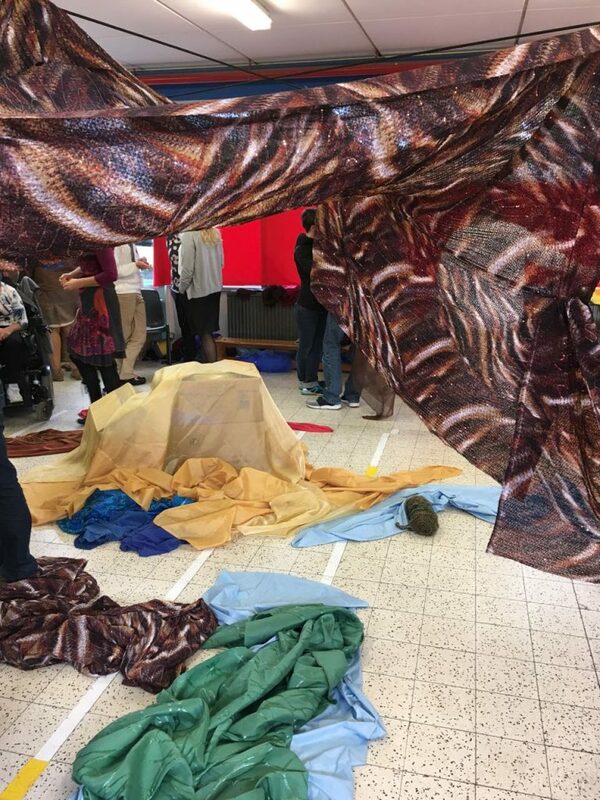 After greeting the stranger and finding shelter for him, the whole community came together to put out the fire with huge bundles of fabric water.